Founded in 2011, Embrace Hearing sells high performance, state-of-the-art premium hearing aids online and ships worldwide from its New Jersey, USA location. Since the company buys directly from a leading German manufacturer, the cost savings are passed on to consumers. Embrace Hearing aids are customized individually based on hearing test results, and offer the highest level of quality with a simple ordering process. Embrace Hearing makes and sells three hearing aid models ranging in price from $699 to $949 per ear. Its hearing aids feature optional hand-held remote control and a variety of colors. Embrace Hearing customizes hearing aids for each customer using hearing tests uploaded on their website or faxed to the company. Embrace Hearing offers three hearing aid models to choose from depending on your needs and budget. Embrace Hearing’s H-300 is a receiver-in-canal (RIC) model is suitable for mild to severe hearing loss. The volume and program control is on a button on the hearing aid, and a telecoil is included for automatic wireless transmission from hearing loops where available for greater sound clarity. Consumers can choose from seven colors. This model has a two-year warranty. The C-650 model is a completely-in-canal (CIC) hearing aid and is recommended for mild to severe hearing loss. A mobile app for iPhone or Android mobile phones controls volume. The C-650 features Tinnitus Manager to significantly reduce symptoms by utilizing a volume-adjustable white noise background sound. The optional Premium Performance Package promises a high degree of sound clarity in noisy settings like restaurants, meetings and crowded rooms. This model has a three-year warranty. Ideal for any level of hearing loss from mild to profound, Embrace Hearing’s H-700 is a RIC hearing aid. The volume is controlled using a button on the hearing aid, and the H-700 includes a telecoil and includes the Tinnitus Manager. Consumers can upgrade to the Speechbeam technology option, which utilizes innovative software and four additional processing channels to deliver 360-degree hearing for the highest degree of clarity in the noisiest environments. Consumers can choose from seven colors, and this model has a three-year warranty. Embrace Hearing sells a standard remote, Bluetooth Premium Remote and a TV volume streamer for use with its hearing aids. The TV volume streamer streams sound directly to your hearing aids so you can adjust the volume to suit you without affecting others in the room. Compatible with the H-300 and H-700 hearing aids, the TV streamer requires Embrace Hearing’s Premium Remote. The Premium Remote not only controls the hearing aids but also enables streaming from Bluetooth-compatible devices like mobile phones, tablets and more. As noted in our Best Hearing Aid Guide, the average cost for a single hearing aid runs around $2,300. Embrace Hearing passes on significant savings to customers because they buy directly from a quality manufacturer then sell directly to consumers. Prices range from $699 to just under $950 per ear. The chart below breaks out costs by model and options, and shipping is free on all purchases. Embrace Hearing offers two monthly payment plans, or you can pay in one lump sum at the time you place your order. Affirm Financing offers six-months no-interest financing or 12 to 18 monthly payments with interest rates ranging from 10 percent to 30 percent. The Care Credit program lets you pay over 12 months with no interest or 24 months at 14.9 percent interest. You have 45 days to try Embrace Hearing aids, and if they don’t work out, you can return them for a full refund. Embrace Hearing has dedicated customer support via a toll-free number, email, fax, or from the website using an online contact form. Help is always available 24 hours a day, every day of the week. 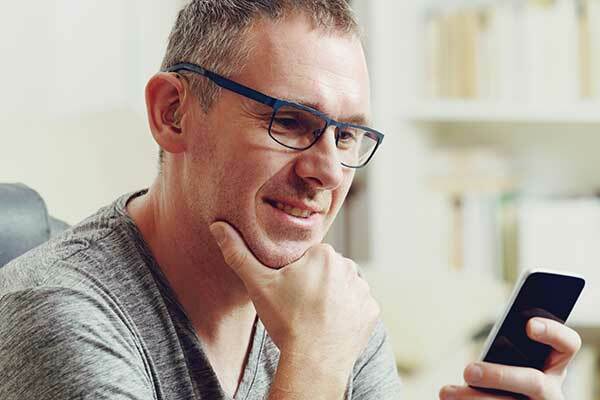 Embrace Hearing’s website has an excellent hearing aid resource library, which includes instructional videos, answers to common questions, service and repair information, a glossary and online accessory store. Embrace Hearing sells the H-300, H-700 and C-650 hearing aids from their website or by phone by calling 888-929-9555. You will need a hearing test from a trained professional audiologist or ENT specialist before you can order, then send the test results to Embrace Hearing via fax, email or upload them on the site. From there, you choose the hearing aids and accessories you want on the website or over the phone. Embrace Hearing’s audiology team is always available to help you make the best hearing aid selection based on your preferences, budget and hearing test. After you place an order, Embrace Hearing’s audiology team custom programs the hearing aids based on the hearing test results. Hearing aids are shipped to the consumer within 5 to 8 days. Embrace Hearing’s hearing aids are ranked first among 15 other brands on ConsumerAffairs. Embrace Hearing is a ConsumerAffairs Accredited Brand with a rating of 4.8 out of 5 stars. The company earned an “A+” rating from the Better Business Bureau with zero complaints and became a BBB-accredited business in June 2016. Positive customer reviews most often emphasize the exceptional, friendly customer support and the quality and affordability of Embrace Hearing aids. What is the difference between Embrace Hearing’s RIC and CIC hearing aids? Embrace Hearing’s H-300 and H-700 are both behind-the-ear RIC models or receiver-in-canal hearing aids. These hearing aids have a compartment with the battery worn behind the ear and a thin transparent wire connected to the receiver worn in the ear. RIC hearing aids are less visible than a traditional behind-the-ear model. CIC — completely-in-canal — hearing aids like Embrace Hearing’s C-650 are very small and have no compartment worn behind the ear. CIC models are nearly unnoticeable, but require more maintenance, as explained in our information about different types of hearing aids. Will my Embrace Hearing aids be comfortable right out of the box? Yes, your Embrace Hearing aids come with everything you need to use them as soon as you receive the shipment. All Embrace Hearing models use an assortment of domes that fit in the ear canal and receiver wires, so no ear molds are required for fitting. It will take some time for you to adjust to hearing all the sounds you’ve been missing, which is the case for all hearing aids. Your brain needs to relearn how to ignore background sounds like footsteps, the turning of a page and other everyday sounds. Do Embrace Hearing aids work for all levels of hearing loss? No one Embrace Hearing model addresses all hearing needs. However, you can find a solution among the company’s three hearing aids, whether your hearing loss is mild, moderate, severe or profound. If you have advanced or profound hearing loss, you’ll need Embrace Hearing’s H-700 hearing aid. How does Embrace Hearing’s Speechbeam feature work? The Speechbeam upgrade works by zooming in on people speaking from the sides, front and behind the hearing aid wearer. Pulling in sound from all directions produces a more natural and brighter sound in noisy environments. What if my Embrace Hearing aids need to be reprogrammed or repaired? Embrace Hearing provides free reprogramming services during the warranty period. After the warranty expires, Embrace Hearing can program and repair your hearing aids, for $150 plus the cost of shipping and with a 48-hour turnaround. However, the company provides videos on the website so you can learn how to maintain your hearing aids yourself. Embrace Hearing sells high quality, affordable hearing aids with several solutions for improving hearing. The three hearing aid models are all built with state-of-the-art technology to offer superior performance for any level of hearing loss. Embrace Hearing ranks highly with consumers for product quality, affordability and highly responsive customer support, making the company a trusted hearing aid provider. To get learn more and start your 45-day trial, call 855-278-3108 or visit the Embrace Hearing website. I had seven-year-old hearing aids that was out-of-date technology, and I missed a lot of what was going on but with having Embrace hearing aids, it’s been better. It can pick up on a whole lot of what I was missing. And also, they were priced a little bit less than what I could get the high-end hearing aids anywhere in Little Rock, Arkansas so, I appreciated it. Everybody at Embrace was very nice and very timely in doing things. At first I had where you had full volume adjustment on each ear. When I got home, I decided that I would rather have one ear where it did the programs and then the other ear where I can lower the volume if I needed to, in case something was too loud. Since I've gotten that done, I've never changed anything. My unit has four different settings but I haven't used the other two controls.